What Are the Odds You'll Meet Your Evil Twin? 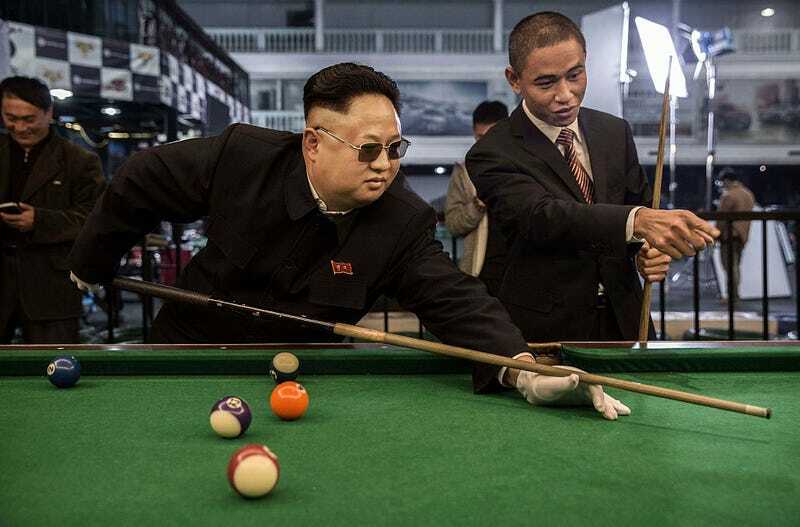 PIctured: Not the real President Obama or Kim Jung Un. (Photo: Getty images). We’ve seen enough science fiction (and soap operas I suppose) over the years to know that your evil twin is just around the corner. But what if they’ve already taken over your life? What if you’re the evil twin?? There is certainly a possibility that one day you’ll meet someone who looks just like you, but what are the actual odds? According to the BBC, Teghan Lucas, a researcher at the University of Adelaide in Australia, compared the faces of nearly 4,000 individuals located in the ANSUR database, a survey of military personnel. Lucas compared eight traits among the photos, measuring the distances between things such as the eyes and ears, and found that in order to find a nearly exact doppelganger, the odds were less than one in a trillion. In a paper published in Forensic Science International in 2015, Lucas described this as reducing people to a “singularity,” meaning so that “only one individual in a specific population has a particular set of characteristics.” Out of the eight traits measured, a maximum of seven were needed to reach that singularity. “Before you could always be questioned in a court of law, saying ‘well what if someone else just looks like him?’ Now we can say it’s extremely unlikely,” Teghan told the BBC. But that’s the statistical probability of finding someone who has nearly the exact same traits as you, who would be your genetic identical. Even people who look alike don’t have more similar genes than people who don’t. If that’s the case, then why do some people seem like doppelgangers? How will we be able to tell them apart in the chance that one of them pulls the “I’m the real one, choose me” scenario? Teghan’s experiments take into account exact measurements, but the human brain only needs approximations to recognize a face. Zaria Gorvett, the writer of the BBC article, reported that the brain uses an area known as the fusiform gyrus to create a bigger, more broader picture when analyzing the features of a person’s face. This is thought to help people recognize friends more efficiently and quickly. According to Scienceline, it also comes down to personal preference and the order in which we take in certain features. If you look at a person’s eyes first instead of, say, their hair, you’ll come away with a completely different picture. Your brain would be putting emphasis on unique areas, meaning that the ways people look to each other are subjective. Have a sibling that people say looks like you, but you don’t see it? That could be a reason why. However, there is still that possibility you could find someone that looks like you. Randomness ensures that something is bound to hit. So lucky for you, there’s a very slim chance that your evil twin will try and take your life.